Tagged: Interview with Tesfamichael Yohannes. Part 2. Thursday 04 April 2019. 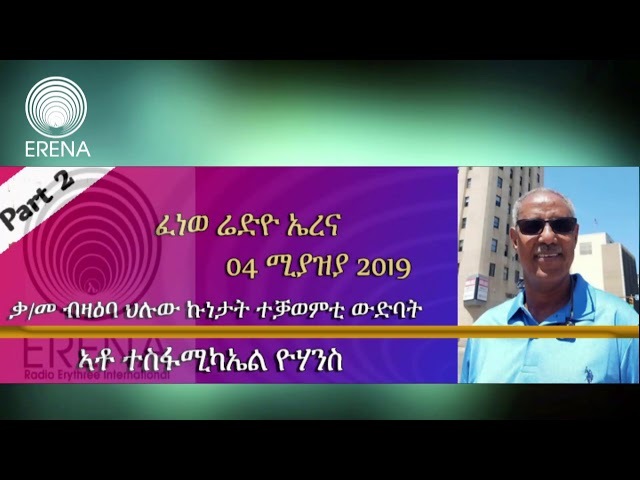 Radio Erena (“Our Eritrea”), a Tigrinya and Arabic language station broadcasting by satellite to Eritrea, began operating on June 15, 2009, in Paris, five days ahead of World Refugee Day. The result of an initiative by Eritrean journalists based abroad and supported by Reporters Without Borders, the station is offering freely-reported, independent news and information to Eritreans in Eritrea. Independent of any political organisation or government, Radio Erena is offering news, cultural programmes, music and entertainment. A network of contributors based all over the world is providing the Paris-based staff with Tigrinya and arabic language programmes that are broadcast via NileSat.